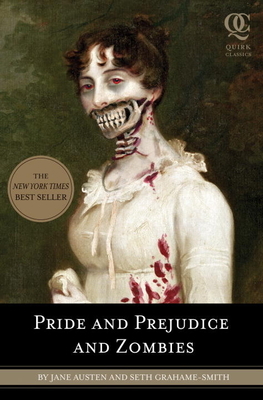 Complete with romance, heartbreak, swordfights, cannibalism, and thousands of rotting corpses, Pride and Prejudice and Zombies is an audacious retelling of English literature’s most enduring novel. This expanded edition of the beloved Jane Austen novel featuring all-new scenes of bone-crunching zombie mayhem begins when a mysterious plague falls upon the quiet English village of Meryton—and the dead are returning to life! Feisty heroine Elizabeth Bennet is determined to wipe out the zombie menace, but she’s soon distracted by the arrival of the haughty and arrogant Mr. Darcy. What ensues is a delightful comedy of manners with plenty of civilized sparring between the two young lovers—and even more violent sparring on the blood-soaked battlefield. It’s the perfect read for literature lovers, zombie fans, and anyone who loves a reanimated Austen. Jane Austen is the author of Sense and Sensibility, Persuasion, Mansfield Park, and other masterpieces of English literature. Seth Grahame-Smith is the author of the New York Times best seller Abraham Lincoln, Vampire Hunter. He also wrote the screenplay for the Tim Burton film Dark Shadows. He lives in Los Angeles.